Music writer and broadcaster Ann Powers explores Joni Mitchell's impact on her fans and on songwriting. "Even the songs of hers I've heard a thousand times can still give me the weird feeling that she knows me personally," she says. In the month of Joni Mitchell's 75th birthday, Ann Powers considers what it is about her music that speaks to people in this way. And how does this emotional connectedness square with an artist who has constantly shape-shifted, who is full of contradictions? She's a master lyricist who dislikes most poetry. Her words challenged who women were supposed to be, who they could be, and yet she bristled against feminism. And when she's had such a powerful effect on so many listeners, why has she only had one top 20 hit? 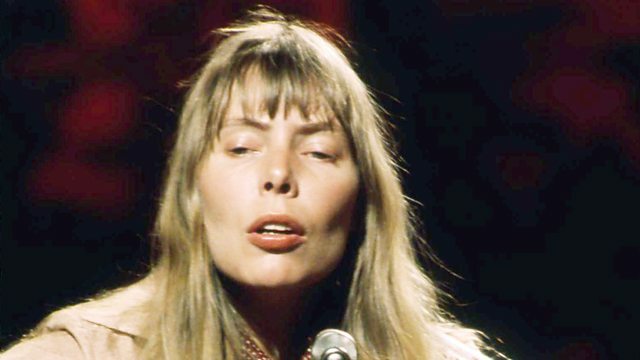 Through excerpts from live BBC recordings from the late 1960s and 70s, and the conversations Joni Mitchell recorded in the same period with broadcaster Malka Marom, we travel across a decade of her music. From the familiar territory of songs like Woodstock, we reach the wilder, exploratory sounds of her late 70s work, via some of her most critically acclaimed albums from earlier that decade - Blue, Court and Spark, The Hissing of Summer Lawns and Hejira. Writers and critics Linda Grant, Sean O'Hagan, Jessica Hopper and Barney Hoskyns reflect on the rapid evolution of Joni Mitchell's musical and lyrical approach, alongside the memories of some of those who've been closest to her -: songwriter and former lover Graham Nash, bassist and ex-husband Larry Klein, and longstanding friend Malka Marom. With thanks to Malka Marom and the Thomas Fisher Rare Books Library at the University of Toronto, for sharing clips Joni Mitchell's conversation with Malka Marom. This article has been viewed 800 times since being added on December 1, 2018.